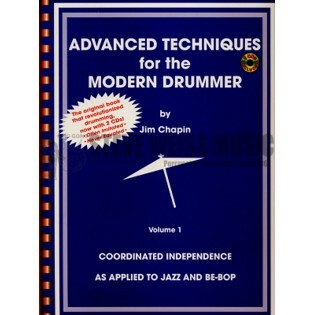 The classic jazz independence book - Advanced Techiques for the Modern Drummer Volume 1 by Jim Chapin - is now new and improved and with two CDs! Jim Chapin, known as the "Father of Jazz Independence," has written one of the most popular drumset books of all time. This classic work should be in every drummer's library as there is always something new to learn and develop from this masterful book. Whether for a beginner or an accomplished drummer, this system will greatly improve independence and coordination, sticking, power, and speed and endurance on the drumset. Dedicated to Sanford Moeller, this book proves Jim's teaching techniques like no other. Generations of drummers have used this book -- a must for every student, it will improve your technique for all types of drumming, not just jazz.